…a place where MAGIC happens! July 17, 2003 Do We Understand Each Other? May 6, 1878 Courtroom Drama: My Family! Where Are You, Roger and Rose Fortier? My daughter informed me that the film, Exit Through the Gift Shop was last year’s news and that somewhere along the way ‘I missed the boat’. I also missed the conversation, apparently, because ‘everyone’ was talking about it. Following the trailer I include below, you can view the movie in its entirety or you can find it on Netflix (Canada) as well. So…with box of soft tissue on the table next to me, a cup of hot lemon and honey, my fuzzy slippers and a big blanket, I curled up with remote in hand. Broken, Boy and Ne le Dis a (with accent, however you do that) Personne were unavailable on Canadian Netflix…but, my fourth choice, Exit Through the Gift Shop (2006) was! Love love loved the introduction to the film by Banksy! As I settled in, I decided to click PAUSE and get my notebook because I sincerely felt smitten by the content that followed. I guess that Rylan Broadbent was the first gentleman/artist/arts educator and all round smart man I’d met who taught me anything at all about street art and graffiti. When I sat on a train from airport to central Paris, I remember leaning my forehead against the train window, in total awe of the images that appeared for miles along the grey cement retaining walls. Apart from this experience and Rylan, however, I had little world knowledge about the movement of street art happening globally. This movie was jam packed with information, as well as amazing archives of intimate happenings and interview segments between videographer, Thierry Guetta and some of the artists he had come to know through his own passion for making recordings. I have some sympathy for this and find, at times, my fascination with capturing ‘the moment’ in nature, reading, art, music, and my experiences with others, comes from a similar revelation about the temporal aspects of all. Writing about or photographing a subject somehow causes it to be sustained for a moment in time. I wonder if that is selfie craze is another manifestation of this practice. Perhaps some people are insecure with the notion that their bodies are temporal and are evolving from youth to old age…and that photographs ARE the self. The catch is, photographs are also ephemeral. This movie got me thinking about a lot of things. When Thierry Guetta takes on the mantle of Mr. Brainwash and successfully earns over a million dollars on his first exhibition, the viewer is left pondering the authentic aspects of art and confronts the forever-question again, “What is art?” Mr. Brainwash has named himself well. Even at the conclusion, other long time street artists are at a loss for words and Banksy promises to never be filmed again. I hope to grab some permissions from photographers so that I can post some photos here soon. 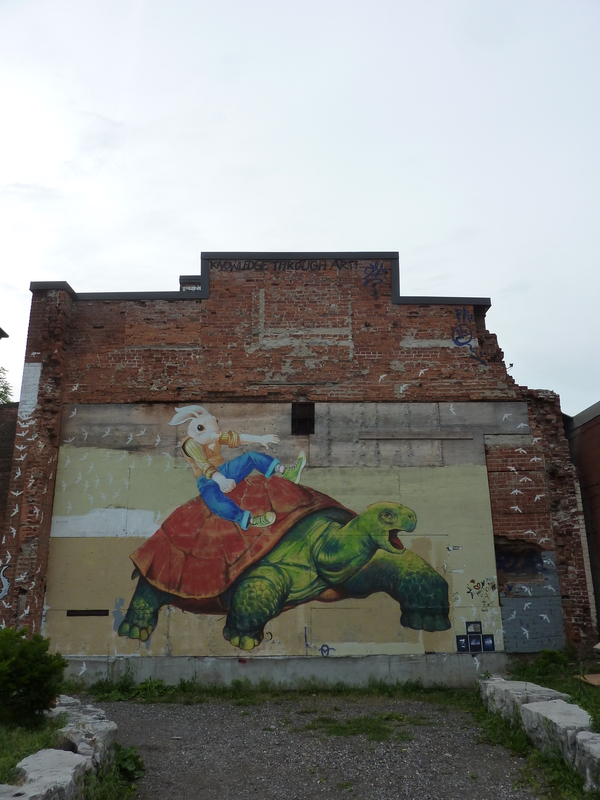 For now, looking for some shots that I took of street art pieces I found in Hamilton, Ontario two summers ago.